As individuals age throughout Tallmadge, Ohio, and all Northeast Ohio, they may experience chronic health issues resulting in limited or substantial loss of mobility. Facing the challenge of stairs to enter one’s North Canton, Ohio, or Fairlawn, Ohio, home can be overwhelming, so deciding on the best home mobility solutions to create a barrier-free living environment is essential for maintaining independence, as well as mental and physical well-being. 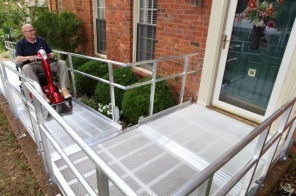 Access Solutions, Inc. can provide compassionate, knowledgeable advice to individuals and families as they consider which product will best fit their lifestyle — from modular, portable, and threshold wheelchair access ramps to vertical platform lifts. Access Solutions, Inc. will also take the time to explain the differences in each product so that each person can acquire the freedom that they deserve. The advantages of modern technology allow for a wide selection of products to assist people in obtaining barrier-free living in their Tallmadge or Fairlawn home. Most people don’t consider the home mobility solutions options that are available until they are faced with the prospect of needing their benefits. Access Solutions, Inc. is dedicated to turning any living or work area into a comfortable and barrier-free living space, whether for installation in someone’s senior parents’ home or for a disabled spouse. One of the first things someone must do upon arrival to their house is enter it, but many porches have steps that prohibit barrier-free entry. Access Solutions, Inc. carries two specific lines that can fulfill those needs — access ramps, available in portable, modular, and permanent configurations, and vertical platform lifts, which can also be configured for a variety of site conditions. Each fit a certain need, depending on the home’s layout. Models of vertical platform lifts range from standard outdoor units to portable, self-enclosed, or hoistway models that accommodate most configurations of a floor plan. Depending on the space available, vertical platform lifts are low-profile and leave a small footprint, making them a cost-effective option in lieu of outdoor ramps or home elevators. They can accommodate from a couple of inches up to 12 to 14 feet. They are a reliable, comfortable product that includes many built-in safety features — such as sensors that detect when something is blocking its path and an emergency stop button. 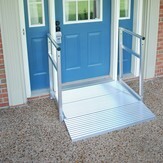 The other solution for entry into a North Canton home or any Northeast Ohio business that is very common is the access ramp. It would behoove anyone to compare the features of a variety of products as they contemplate which is best for their situation. Ramps need to be 1:12 slope, which is one foot of run for every inch of rise, so they’re likely to take up more space. There are portable, modular, and permanent ramps. One of the biggest benefits to access ramps is that they require little to no maintenance. Modular ramps are ideal for rental situations or where long-term utilization is not warranted, because there is no permanent modification to any structure. They are usually prefabricated of extruded aluminum, mesh-style decking surface, rails, and supports, but installed on-site. Portable ramps are ideal for lower rise height, up to 8-inches, and not for extended use in one place. Perhaps someone is taking their mother to Thanksgiving dinner at Aunt Sophie’s house. This ramp can be taken and placed in a doorway to get the wheelchair inside any home; however, they are generally removed after each use. People throughout Northeast Ohio tend to avoid considering what they would do if they were to either become disabled or find the need for home mobility solutions, such as access ramps. It is a difficult topic to discuss; however, the compassionate and helpful people at Access Solutions, Inc. are always available when someone in North Canton, Ohio, or Fairlawn, Ohio, reaches the point that they are deliberating consulting someone about barrier-free living. 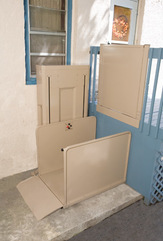 Whether someone in Tallmadge, Ohio, has a small area in which to work and requires a vertical platform lift, or they just need an effective way to enter their home and maneuver between rooms with modular, portable, or permanent ramps, Access Solutions, Inc. can help them find the perfect product to fit their needs, and bring them back to the freedom that they once realized. This entry was posted in Handicap Modifications, Home Improvement, Shopping, Specialty Shops and tagged access ramps North Canton Fairlawn Tallmadge Northeast Ohio, Access Solutions Inc, barrier-free living North Canton Fairlawn Tallmadge Northeast Ohio, home mobility solutions North Canton Fairlawn Tallmadge Northeast Ohio, modular ramp North Canton Fairlawn Tallmadge Northeast Ohio, permanent ramps North Canton Fairlawn Tallmadge Northeast Ohio, portable ramps North Canton Fairlawn Tallmadge Northeast Ohio, vertical platform lifts North Canton Fairlawn Tallmadge Northeast Ohio by admin. Bookmark the permalink.